Ryan Pendlebury calls the shots during a break on the boundary line on Friday night. Photo: Collingwood Media. Collingwood continued its preparations for the VFL season with a 12-point win over Coburg at the Holden Centre on Friday night. 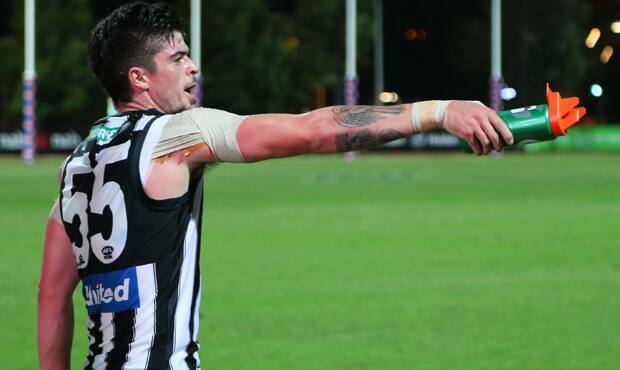 Though the pre-season win won’t count for more than a boost in confidence, it was an encouraging result for the Magpies to achieve for the match was played without any AFL-listed players. The Pies got off to a blistering start, kicking four goals to one in the opening term to lead by 22 points at the first change. They weren’t able to match these levels of fluency in the next three quarters, as increased pressure from their opponents and drizzling rain in the second half caused a much scrappier contest. The hosts were still able to keep the Lions at arm’s length throughout to end with a win. Collingwood VFL General Manager Chris Dixon says he was pleased with the application showed by his side early. “Our energy and our pressure early on was exceptional. Our forward pressure was really, really strong in the first quarter and that reflected on the scoreboard,” he said. The club’s AFL list trained as a group earlier on Friday morning as it prepares for its round one match against Hawthorn next week, and were unavailable to play tonight’s game. Dixon and the coaching staff used the chance to assess players on the VFL list who may be short on playing time. “It was a really good opportunity for us to play as a VFL squad, which doesn’t happen too often,” Dixon said. The void left by the absent AFL-listed players was filled by a combination of new and young faces. “I thought Nick Reeves-Smyth, who’s on our rookie list, showed some really good signs up forward. “Of the older brigade, I thought Lachlan Howe in the ruck and Jack Hellier led the way. Collingwood will continue to build towards the VFL season with a third practice match on Friday afternoon against Box Hill at the Holden Centre.